Best Bachelorette Party ever in the Okanagan. Afternoon High Tea served outside on the patio. 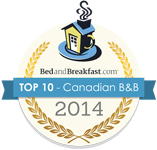 Book a night @ one of Canada’s Top B&Bs – A Touch of English. Club Wine Tours will pick you up for dinner at one of the local wineries. Enjoy a wine tour during the day; relax with your own picnic. Book your Okanagan adventure for the bride to be, with her best friends and bridesmaids. Plan a Bachelorette weekend at a world known Bed & Breakfast in Kelowna. Combine an amazing wine experience visiting the local wineries, for either dinner or a day trip, take memorable photos overlooking the valley views and return to the B&B to enjoy the large pool with refreshments. Wine Tour $75.00 per person.